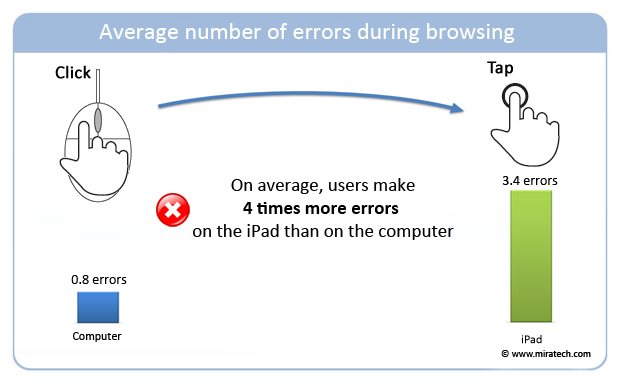 Miratech has conducted a study to determine how web browsing differs between an iPad and a computer. Conclusion : It’s hard to browse the web with an iPad. 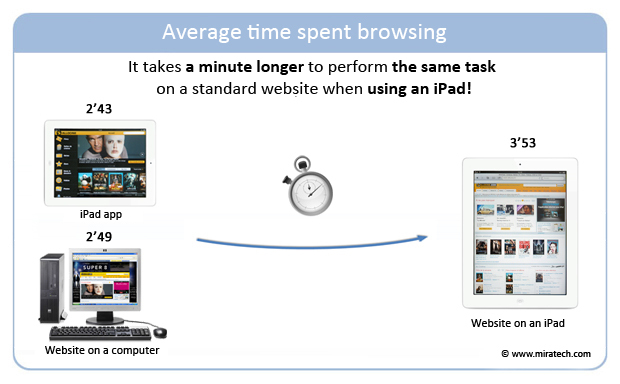 Our study measures web browsing on different devices, using different interfaces. We tested a representative sample of 20 users in our user testing labs. All of them were familiar with the iPad. We had them browse through five well-known French websites that all have their own iPad app. To reduce the risk of bias caused by familiarity, we rotated the order in which the interfaces were used. First, we let the participants browse freely around each of the sites/apps, and then we assigned them specific tasks. Our team compiled and analyzed the results using technologies such as eye-tracking. It is much easier to perform specific tasks on a computer. Participants looked at fewer pages on a computer and they made far fewer errors to achieve the same result, especially when searching for and buying a product. What’s more, users are wary of m-commerce sites and still reluctant to use the iPad for online shopping. 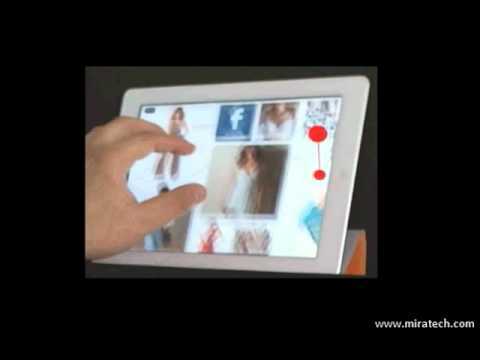 For example, many users think that the products available on the website are not all available on the iPad. 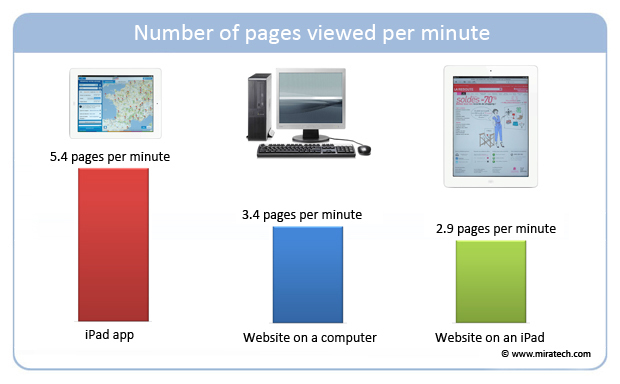 When users were free to browse as they pleased and didn’t have a set task to perform, they were faster and viewed more pages on an iPad-optimized app. This is because the iPad interface is more fluid and the swipe feature encourages users to flick through content. These findings are consistent with those of earlier studies: it’s easy for users to flip through the pages of an iPad looking for content. Standard websites are not easy to use on a tablet. We noticed that many of our participants experienced frustration due to a high number of tap errors. As a result, tasks took much longer and there was an obvious risk the user would just give up. What’s more, the users hardly used the zoom function, which actually would have made it easier to browse with the iPad. We’ll take a closer look at this result in our next study. Finally, the number of tap errors was just as high on the apps. But the fun of swiping and the overall ease-of-use largely made up for the resulting frustration. The computer is still the most efficient technology for performing specific tasks such as online shopping. The iPad, on the other hand, is great for discovering content, as long as you use its specially-designed apps.